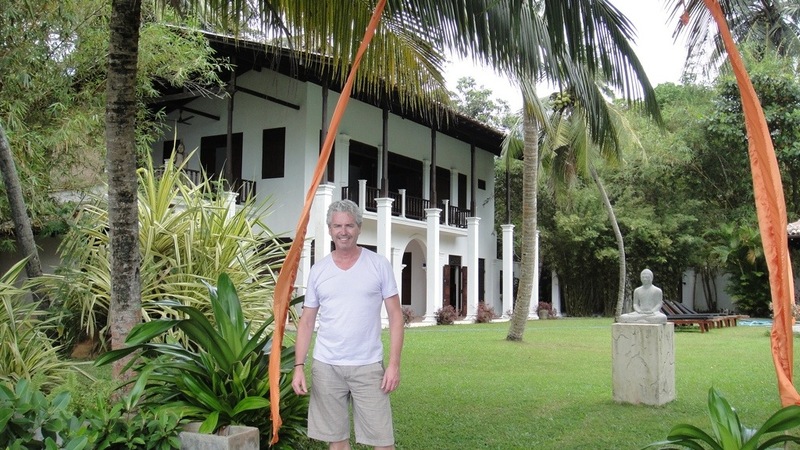 I’m still in paradise, which takes the form of a private villa called ‘Mandalay‘, located on the beautiful palm-fringed south coast of Sri Lanka. Back to Mandalay. It’s a two-storey villa on the edge of a river looking over an island that is a bird sanctuary. Every evening the sky is an avian highway leading from beach to island. From the river jetty, we look up the banks to a lawn, a twenty metre pool and a pavilion that houses the lounge, dining area and kitchen. To the left is the two-storey villa, with a master suite taking up the entire top floor, and downstairs two bedrooms either side of the main indoor lounge (which we have yet to use!). Every room opens to the garden along one side with a combination of teak French doors and shuttered windows. The roof of the villa and pavilion is made from curved terracotta tiles (very Roman/ French Provincial) that occasionally come sliding off with a thud, thanks to a combination of efforts from the squirrels, crows and monkeys that clamber over them. So life at Mandalay consists of waking up, walking through the local village where we are greeted with pearly white smiles and a combination of “good morning” and “ayubowan” (local for hello, goodbye, live a long life, may the bed bugs never bite you, etc) and then a morning dip in the Indian Ocean. The water is so clean and clear. On our return, Dulcie makes us a pot of tea, and we wait expectantly like little birds for Chintaka to place breakfast in front of us. Fruit, fresh watermelon juice and then either a curry breakfast or western fare. Then it’s a day filled with reading, swimming reading, swimming, reading, swimming … get the picture?! Of course the afternoon is spent with a gin and tonic in one hand and a book in the other, waiting for the next meal. 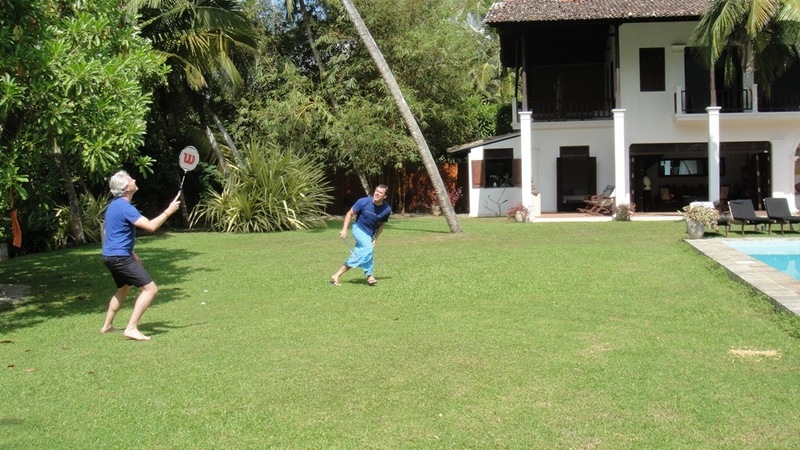 We shook things up a bit yesterday and played badminton on the lawn. Did I hear some colonial-era groans? Hey, I had the option of croquet. But even I couldn’t take the “mad dogs and englishmen” stereotype that far. Besides, I have no white linen to wear and I didn’t think to pack my Panama. So Mike, Mum (who has permanent lung damage from an infection years ago), Dad (who’s almost eighty with two artificial knees) and I sweated it out hitting a shuttlecock around the villa gardens. Who said badminton is a non-contact sport? I now have a broken toe! It resulted from a very graceful dive, although I may rethink playing in a a full-length sarong and thongs next time. Or at least wear underwear under the two metres of fabric that makes up a Sri Lankan sarong. Lucky I’m with family. We know when it’s almost dusk because Dulcie closes up the villa and places a mosquito coil in just about every corner, under every piece of furniture. It’s like being in a smoke house – even ‘Robert’, our resident shower frog, heads for cover. Life is so relaxing. This morning’s breakfast consists of a conversation between the four of us of “What day is it today?”. Yawn, stretch, scratch (bloody mossies). But then who really cares? This entry was posted in Sri Lanka and tagged Mandalay, Sri Lanka. Bookmark the permalink. 1 Response to There were three of us in bed last night! Darling thong is singular and no wonder you tripped over with a sarong falling around it!